Editor's Note: Ben B. ('16) used a random number generator to randomly compose some music. For my Precalculus “Explore Math” project, I devised a system by which I could use a random number generator to compose sixteen measures of random music. 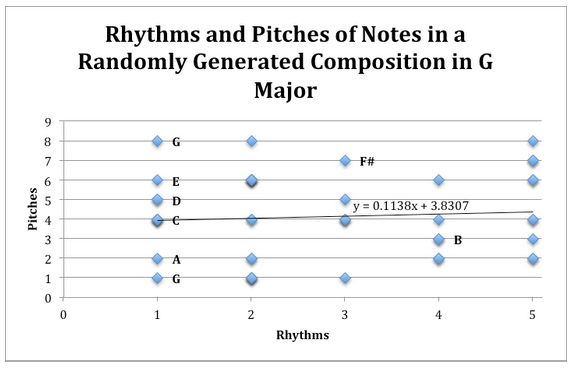 Initially, I assigned numbers 1-5 to five different values of note length to determine the rhythm and 1-13 to the twelve pitches in an octave starting at C (with an extra high C as the thirteenth value). For example, a result of 2 and 7 would represent an F-sharp eighth note. For a second composition, I decided to use numbers 1-8 to represent the seven pitches in a G major scale with an extra high G. I did this in order to see if the random composition could be made more melodic, but the original composition using the chromatic scale ended up being more interesting. I think this was because although the second composition removed dissonant pitches, the number of pitches available to use was too limited and notes were repeated too often. 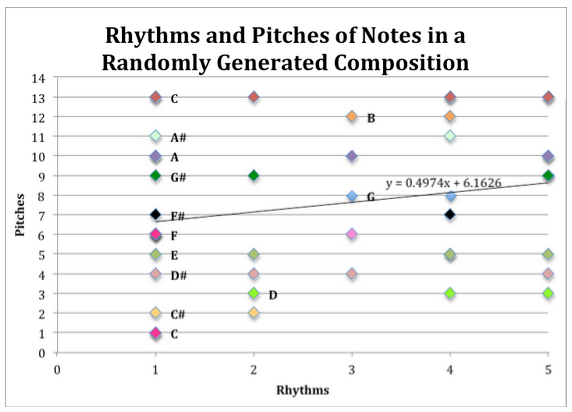 After creating the compositions, I graphed the notes on scatter plot with the pitches on the y-axis and the rhythms on the x-axis. Additionally, I graphed the first two measures of J.S. Bach’s Invention in C Major, having to slightly alter the system to account for the greater range of Bach’s notes. 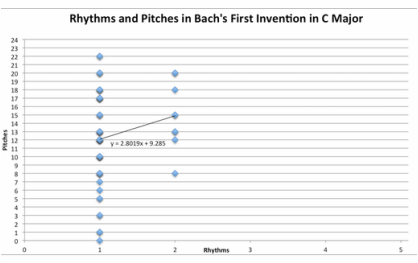 Surprisingly, while the graph of the Bach composition looks very different from the other two graphs (because it consists mostly of sixteenth notes), it has a very weak correlation (r ≈ 0.19). This may have something to do with the fact that there are so many sixteenth notes but also a significant number of eighth note outliers. The graphs of the random compositions appear, to some extent, much more formal. Each pitch is represented about three times, and the plots are filled out in neat rows. The composition consisting of every note in the octave actually has a greater correlation (r ≈ 0.21) than the Bach piece does. This is interesting because we think of classical music (and especially the music of Bach) as being incredibly logical and exact, but according to a graphical interpretation, random compositions are more logical and formal. 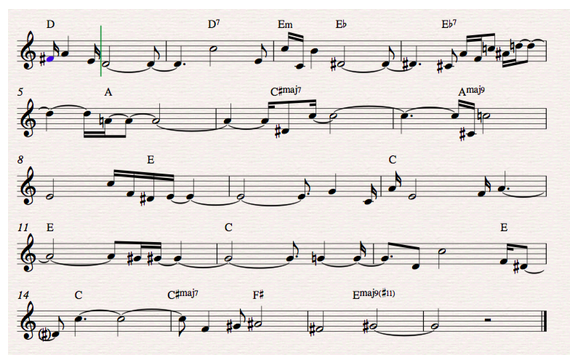 If I do this again in the future, I’d like to find a way to graph time as well as rhythm and pitch. If I were to do that, I have a feeling the Bach would look much more logical whereas the random compositions would seem more, well, random. Along with this explication, I’m submitting audio of the random compositions, as well as versions I created as electronic music songs with harmony and backing sections as an attempt to show that even random pitches can sound like real music. My randomly composed music can be found here.